In the late 1980´s, many train fans and toy enthusiasts were curious about the quality put into the LGB trains produced in Germany. Because of this, many took the time to visit the home of LGB while traveling in Europe. Amazingly, they discovered that the history of the company went back to 1881 where Ernst Paul Lehmann and Jean Eicher founded a tin toy factory in Brandenburg near Berlin. In 1921, Lehman's cousin, Johannes Richter, entered the company with great success until 1948 when the communist expropriated the company. With no options available, the Richter family fled to West Germany. In 1968, the sons of Johannes Richter, Eberhard, and Wolfgang introduced LGB - THE BIG TRAIN. This was history in the making as the hobby of model railroading and especially garden railways grew with a great amount of enthusiasm. In 1989, Wolfgang Richter the owner of LGB at that time came up with the idea of organizing a tour that would include a factory visit, with a behind the scenes look at what goes into building those special trains. What motivated this idea where requests on a daily basis for factory visits. Naturally then came questions about the location of the original prototypes. 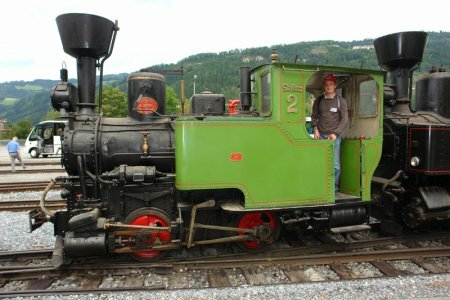 One example is the famous LGB Stainz #2, which was inspired by four narrow-gauge locomotives (760 mm), built for the Steiermärkischen Landesbahnen (StLB) in 1892 by Krauss of Linz. The four locomotives StLB were numbered from 1 to 4 with the following names. 1 "Meran,” 2 "Stainz,” 3 "Gobonitz,” and 4 “Heiligengeist.” Number 1 and 2 served the Preding-Stainz local line, and number 3 and 4 served on Pöltschach-Gonobitz local line. Number 3 “Gobonitz” unit is preserved at the Railroad Museum of Ljubljana. The “Stainz 2” in 1969 was transferred to the Murtalbahn for rail enthusiasts to ride. The Stainz 2 is still visited and photographed often by LGB tour groups. LGB tours were then designed to include excursions with the prototypes of the trains that are at home on garden layouts and/or what was found on the production line during the factory visit. The idea and marketing value turned out to be so successful that for each tour a special souvenir wagon was produced. The success spread very quickly because each tour consisted of train enthusiasts with family and friends from all over the world. Many of the participants were in clubs or organizations that often met. The marketing idea was a win-win situation and the tours became very popular. The guidelines for the tours had to reflect the commitment to the LGB product. Quality and details were of first priority, and riding the trains that we play with at home was a must. Prototypes were easy to find and there was no better way to bring the hobby alive. In 1991, the first officially sponsored LGB tour was with the Cincinnati Garden Railway Club from the USA. The news spread by word of mouth very quickly throughout the USA as it was part of a larger organization nationwide, which was growing very quickly. At the same time, many international train organizations and clubs showed interest in the idea of combining a factory visit with a train tour. Requests to plan more tours and personal visits to the factory started the wheel turning. Since 1992, the official LGB magazines (English and German version) have sponsored the tours each year with articles and photographs of the highlights of the train tours. 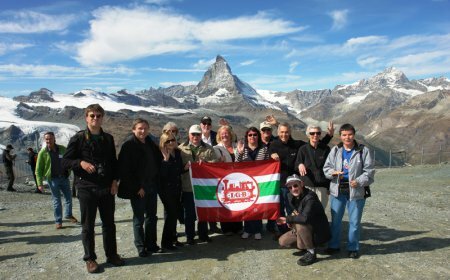 As of today there have been over 120 LGB tours organized with international train fans interested in traveling together. 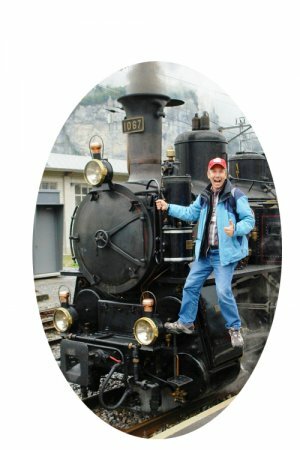 On each tour, wonderful creative ideas have been shared among enthusiasts while visiting private and commercial train layouts, riding and exploring train routes that only feed the imagination for your next layout or just new ideas to add to your existing railroad at home or business. LGBTOURS is still going strong and very successful. In 2007, the German Toy manufacture Märklin acquired the LGB brand and has worked very hard to keep the quality and name of the product strong. A partnership between LGBTOURS and Märklin supports and markets the hobby of model railroading today. This partnership extends to clubs, organizations, magazines, and individuals who are all interested in furthering this great hobby. To keep the hobby alive and ensure that it moves in the right direction, all train fans need to pull together. LGBTOURS is doing what it does best by bringing international train fans together, by riding the prototype trains, visiting private and commercial layouts from all scales of trains, and most of all, combining the hobby with your family and friends on vacation. The secret of our success is obvious; we ride the trains that Märklin/Trix/LGB produces. Taking the time to travel on trains with locomotives or wagons that you own or plan to purchase as a model brings the personal side of the hobby home. For comments and suggestions on future tours, please feel free to contact LGBTOURS or your Märklin/Trix/LGB club. We look forward to your support and riding the rails together.